A few days ago we reported on the Ramble FX folks and their Twin Bender, their take on the Tonebender MKII. Today I just saw an earlier news story on the update of the Solar Bender from Magnetic Effects. We didn’t have the Magnetic Effects folks in our database yet, so it was great to get the opportunity to learn more about them and their pedals. These folks are making pedals out of London, England and have a great line up to offer. It looks like they are releasing a new Solar Bender. 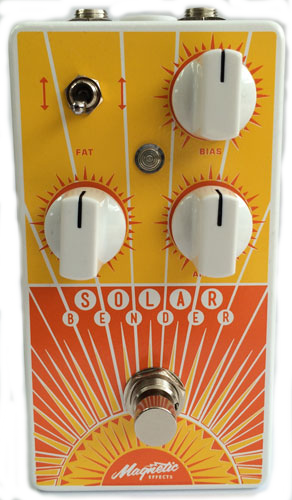 According to their website: “The Solar Bender is a clone of the famous Tonebender MK II complete with NOS PNP germanium transistors and Reverse Polarity Circuit.” What people talk about most when they mention the MKII is its affiliation with early Led Zeppelin records. Yes, it was a favorite of Jimmy Page. Perhaps the reason is how versatile it is with a great, thick, fuzzy tones. It can screech at the drop of a hat or purr like a kitten depending on your playing style and settings. This is the reason this pedal keeps getting revisited time and again. Beyond all that, the Solar Bender has a charge pump that acts as a polarity reversing circuit. For those of you that like to play more than you like to know what goes on inside your stomp, just know that this pedal can be used with a standard 9v adapter and it will even daisy with other pedals on your board. A small consideration, but one that makes this pedal way more board friendly. So check out this builder and this pedal and let us know what you think! We’ll let you know when we have the rest of their pedals in the database.